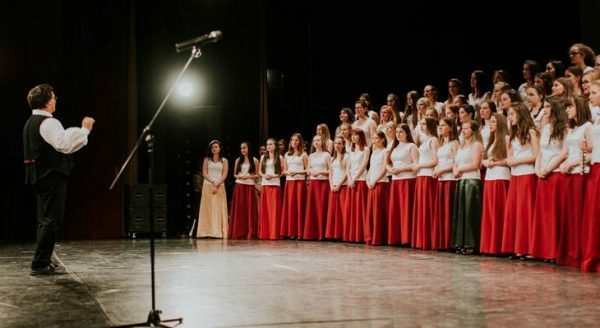 The AURIN GIRLS’ CHOIR was formed in 1998 in the famous Kodály School of Kecskemét, of girls over 15 who were previously members of the Miraculum Children’s Choir. Now the choir is among the best youth choirs in Europe. The founder and director of the choir is László Durányik. The choir’s aims are: to play an important role in the cultural life of our town, to be part of Hungarian musical life, to take part successfully in national and international concerts, festivals and choir competitions, to make high quality recordings and to represent Kodály’s home-town, Kecskemét, in a fitting way all over the world. The Girls’ Choir has been awarded 21 first prizes up to 2017. They won 1st prizes in Riva del Garda, Debrecen, Kalundborg, Grado, Budapest, Llangollen, Lecco, Krakow, Wroclaw, Ohrid, they became Olympic Champions in China, they won 2nd and 3rd prizes in Maasmechelen, Celje, Arezzo. The girls visited a plenty of countries for festivals, concert tours: England, Wales, Scotland, Norway, Denmark, Belgium, Germany, Switzerland, Slovakia, Slovenia, Czech Republic, Slovenia, Italy, Spain, Romania, France, China, Poland, Cyprus, Macedonia, Bulgaria. The choir is always trying to augment its repertoire, which is based on Renaissance to 20th century music, with a special focus on choral works by Kodály, Bartók, Bárdos, Kocsár and Orbán.